This sacred Council has several aims in view: it desires to impart an ever increasing vigor to the Christian life of the faithful; to adapt more suitably to the needs of our own times those institutions which are subject to change; to foster whatever can promote union among all who believe in Christ; to strengthen whatever can help to call the whole of mankind into the household of the Church. The Council therefore sees particularly cogent reasons for undertaking the reform and promotion of the liturgy. 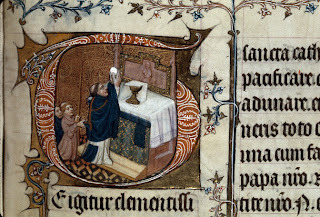 For the liturgy, through which, most of all in the divine Sacrifice of the Eucharist, "the work of our redemption is accomplished," ("Liturgia enim, per quam, maxime in divino Eucharistiæ Sacrificio, 'opus nostræ Redemptionis exercetur'": 1 - Secret of the ninth Sunday after Pentecost), is the outstanding means whereby the faithful may express in their lives, and manifest to others, the mystery of Christ and the real nature of the true Church. On this last ferial day in July 2007 (month of Summorum Pontificum), on which the Mass for the Ninth Sunday after Pentecost is celebrated, it is appropriate to recall what was the "Mass of the Council": the ancient Mass, which was "never abrogated". 3. Two liberals go to the traditional Mass: one loves it ("In my desire to return to church, I see the Latin Mass as an acceptable solution: ... Bring back the Latin, and bring back an embattled believer"); the other tolerates it ("Smart, devout, ambitious Catholics ... will have their Mass. The rest of us... will have ours."). Quite a progress for two "progressives"! Cardinal Martini could learn from them. 4. Thanking the pope: one idea. Martini picture source: Father Blake. In the Conciliar Constitution [on the Sacred Liturgy, Sacrosanctum Concilium], the introduction of a three-year Lectionary is nowhere spoken of. Through it the reform commission made itself guilty of a crime against nature. A simple calendar year would have been sufficient for all wishes of change. The Consilium [ad exsequendam Constitutionem de Sacra Liturgia] could have stuck to a yearly cycle, enriching the readings with as many and as varied a choice of collection as one would want without breaking up the natural yearly course. 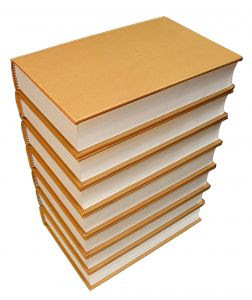 Instead, the old order of readings was destroyed and a new one introduced, with a great burden and expense of books, in which as many texts as possible could be accommodated, not only from the world of the Church but also-as was widely practiced-from the profane world. Apart from the pastoral difficulties for parishioners' understanding of texts demanding special exegesis, it turned out also as an opportunity -which was seized- to manipulate the retained texts in order to introduce new truths in place of the old. Pastorally unpopular passages-often of fundamental theological and moral significance-were simply eliminated. A classic example is the text from 1 Cor. 11:27-29 ["Therefore whosoever shall eat this bread, or drink the chalice of the Lord unworthily, shall be guilty of the body and of the blood of the Lord. But let a man prove himself: and so let him eat of that bread, and drink of the chalice. For he that eateth and drinketh unworthily, eateth and drinketh judgment to himself, not discerning the body of the Lord."] Here, in the narrative of the institution of the Eucharist, the serious concluding exhortation about the grave consequences of unworthy reception has been consistently left out, even on the Feast of Corpus Christi. The pastoral necessity of that text in the face of today's mass reception without confession and without reverence is obvious. The Most Holy Sacrament, "seed of immortality"
The venerable Sacrament of the Eucharist is both the source and the pledge of blessedness and of glory, and this, not for the soul alone, but for the body also. For it enriches the soul with an abundance of heavenly blessings, and fills it with a sweet joy which far surpasses man's hope and expectations; it sustains him in adversity, strengthens him in the spiritual combat, preserves him for life everlasting, and as a special provision for the journey accompanies him thither. And in the frail and perishable body that divine Host, which is the immortal Body of Christ, implants a principle of resurrection, a seed of immortality, which one day must germinate. That to this source man's soul and body will be indebted for both these boons has been the constant teaching of the Church, which has dutifully reaffirmed the affirmation of Christ: "He that eateth my flesh and drinketh my blood hath everlasting life; and I will raise him up at the last day" (John vi, 55). 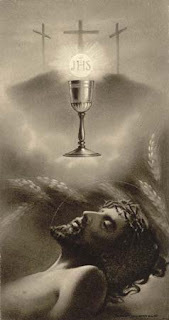 In connection with this matter it is of importance to consider that in the Eucharist, seeing that it was instituted by Christ as "a perpetual memorial of His Passion", is proclaimed to the Christian the necessity of a salutary selfchastisement. For Jesus said to those first priests of His: "Do this in memory of Me" (Luke xxii, 18); that is to say, do this for the commemoration of My pains, My sorrows, My grievous afflictions, My death upon the Cross. Wherefore this Sacrament is at the same time a Sacrifice, seasonable throughout the entire period of our penance; and it is likewise a standing exhortation to all manner of toil, and a solemn and severe rebuke to those carnal pleasures which some are not ashamed so highly to praise and extol: "As often as ye shall eat this bread, and drink this chalice, ye shall announce the death of the Lord, until He come" (1 Cor. xi, 26). Furthermore, if anyone will diligently examine into the causes of the evils of our day, he will find that they arise from this, that as charity towards God has grown cold, the mutual charity of men among themselves has likewise cooled. ... Hence frequent disturbances and strifes between class and class: arrogance, oppression, fraud on the part of the more powerful: misery, envy, and turbulence among the poor. These are evils for which it is in vain to seek a remedy in legislation, in threats of penalties to be incurred, or in any other device of merely human prudence. Our chief care and endeavour ought to be... to secure the union of classes in a mutual interchange of dutiful services, a union which, having its origin in God, shall issue in deeds that reflect the true spirit of Jesus Christ and a genuine charity. This charity Christ brought into the world, so that with it He would have all hearts on fire. For it alone is capable of affording to soul and body alike, even in this life, a foretaste of blessedness; since it restrains man's inordinate self-love, and puts a check on avarice, which "is the root of all evil" (1 Tim. vi, 10). Besides all this, the grace of mutual charity among the living, which derives from the Sacrament of the Eucharist so great an increase of strength, is further extended by virtue of the Sacrifice to all those who are numbered in the Communion of Saints. For the Communion of Saints, as everyone knows, is nothing but the mutual communication of help, expiation, prayers, blessings, among all the faithful, who, whether they have already attained to the heavenly country, or are detained in the purgatorial fire, or are yet exiles here on earth, all enjoy the common franchise of that city whereof Christ is the head, and whose constitution is charity. 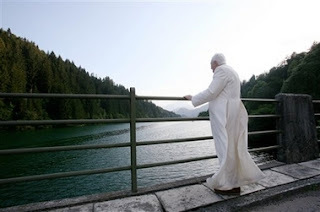 Benedict XVI left the village of Lorenzago di Cadore (Belluno), where he spent his vacation since July 9, right before 1645 [1445 GMT]. "Arrivederci," he said to the representatives of the local community who went to the castle of Mirabello to greet him. The Pope, however, did not want to answer the questions of journalists on the workload which he must face in his return to work. "This is not a moment for interviews, but only for a greeting," he told the reporters. Is the Pope concerned with some negative reactions [in the reception] of the "Motu proprio" on the old missal? 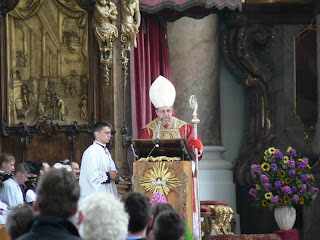 [Gänswein:] I have noticed with some surprise, closely following the press clippings and the public reactions to the "Motu proprio", that there have not been truly negative reactions. There do not seem to be, to me, explicitly negative reactions; the few critical opinions I have noticed are quite normal and acceptable in the sum of opinions which have been heard. I have nevertheless noticed that the text, and the letter of the Pope to the Bishops which accompanied it, have been received with great understanding and objectivity. We hope that the reception may render good fruits and the expected results. 2. A text of great historical interest: the Pope's last answer in the meeting with the clergy of the Dioceses of Belluno-Feltre and Treviso (in English) on the difficult historical aftermath of the Second Vatican Council. 30 Giorni (30 Days) has a very interesting interview (Italian) with Cardinal Castrillón Hoyos, President of the Pontifical Commission "Ecclesia Dei", regarding the motu proprio Summorum Pontificum - though his answers are substantially similar to the ones in the interview granted to Il Giornale and translated here. The current (June 2007) issue of 30 Days will be made available in English in a few weeks. Your Eminence, what is the sense of the motu proprio which liberalizes the use of the Missal said of Saint Pius V? 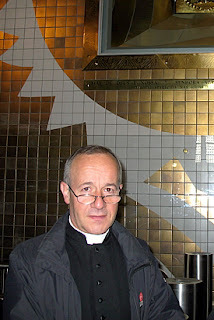 DARÍO CASTRILLÓN HOYOS: When, after the Second Vatican Council, there were changes in the liturgy, consistent groups of lay faithful and even of clerics felt confused because they were strongly attached to the liturgy in force for centuries.I think about the priests who for fifty years has celebrated that Mass said of Saint Pius V and that all of a sudden found themselves forced to celebrate another one, I think about the faithful, for generations accustomed to that rite, I also think about the children such as the altar boys who all of a sudden found themselves overwhelmed about serving Mass with the Novus Ordo. It was then a confusion in several levels. For some, it was even of a theological nature, believing that the ancient rite expressed the sense of sacrifice better than the one introduced. Others, even for cultural reasons, remembered with nostalgia the Gregorian [chant] and the great polyphonies which were a richness of the Latin Church. Making it all worse was the fact that those who experienced this confusion blamed the Council for these changes, when in truth the Council itself had neither asked for nor predicted the details of these changes. The Mass celebrated by the Conciliar Fathers was the Mass of Saint Pius V. The Council had not asked for the creation of a new rite, but for a wider use of the vernacular language and for a greater participation of the faithful. ...and the second [mistake of those who oppose the motu proprio]? CASTRILLÓN HOYOS: That it is about reducing the episcopal power. But that is not so. The Pope has not changed the Code of Canon Law. The bishop is the moderator of the liturgy in his own diocese. But the Apostolic See has the competence to order the sacred liturgy of the universal Church. And a bishop must act in harmony with the Apostolic See and must guarantee to each faithful his own rights, including the one to be able to participate in the Mass of Saint Pius V, as an extraordinary form of the rite. CASTRILLÓN HOYOS: That is the clear evidence as to how, regarding this motu proprio, pseudo-news[reports] were spread out by those who had not read the drafts or by those who, in an interested manner, wished to influence its elaboration. I have followed the entire iter which has led to the final text and, as I recall, no minimum limit of faithful ever appeared in any draft, not of thirty, not of twenty, not of a hundred. In the aftermath of this meeting [on June 27, with Bishops chosen to know the text of the motu proprio], what were the variations [introduced] to the text of the motu proprio which had been prepared? CASTRILLÓN HOYOS: Some small lexical variations were requested and thus introduced, nothing else. "I hope... to see the Pope in Beijing"
I hope, with all my strength, to be able to see the Pope one day here in Beijing, celebrating Mass for us, the Chinese. Italian Catholics cannot imagine how much he wish to see him. By way of La Repubblica, I wish to send the Pope a special salutation: may he know that we always pray for him and that the Lord may give us the grace to welcome him among us. I was twice in the Holy City, the first one in 1991, and the second in 1994, and I had the grace of being able to see John Paul II; I was moved and awestruck. But when I rose in the morning to go to mass, I was terrified: the Roman parishes were semi-empty. I recall that I entered a church in which there were only seven faithful, in another one four, in one I was the only one to attend Holy Mass. I even cried, of sadness and of humiliation. Italy is the land of Catholicism, but it is in China that the churches are full. 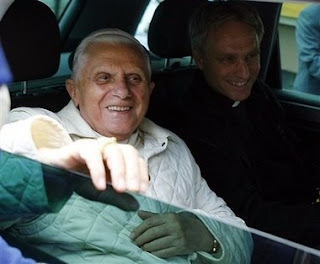 Transcript sources: Papa Ratzinger; Korazym. Sancte Christophore, ora pro nobis! ... The revision of the list of saints inscribed in the general calendar of the Roman Church proceeds from the general principles just presented. 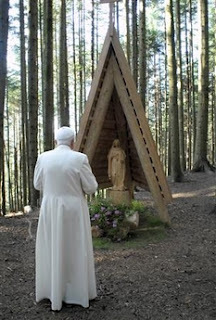 Best report of the Pope's vacation in the Cadore region. "Good evening! ", he said. "What an honor, Holiness...", some answered. A lady reminded him of her having sent a bouquet of stelle alpine [edelweiss]. "Yes, that is true, thank you! ", the Pope answered. "I sent you mushrooms," another one said. "Ah, yes, the mushrooms, I have eaten them," said Ratzinger. Then, approaching the journalists who expected him with open notepads, he shook their hands and asked them: "Why do you write? There is no news...". Il y a peu de réactions officielles au motu proprio «Summorum Pontificum» des évêques et des autorités ecclésiastiques des régions francophones (notamment la France, la Suisse Romande, le Québec et l'Afrique francophone) dans notre collection en langues diverses. Vous pouvez nous aider en ajoutant des nouvelles réactions (ou omissions) ici. Hay pocas reacciones al motu proprio «Summorum Pontificum» de los obispos y autoridades eclesiales de naciones de lengua española (en particular, de España, Colombia, Argentina y Centroamérica) en nuestra colección en varias lenguas. Ustedes pueden ayudarnos a mantener nuestra colección actualizada. By solemnly recognizing that the Missal said of Saint Pius V has never been abrogated..., Benedict XVI renders justice to this Missal. Rendering justice to those who have defended it, at the price of ecclesiastical sanctions, remains. It is in this sense that we beg of the Holy Father for the lifting of the decree of excommunication concerning Abp. Lefebvre and the bishops consecrated by him. ...with full heart, it [the Fraternity of Saint Pius X] hopes to add its part in the doctrinal discussions which it will entail with Rome when [Rome] lifts the decree of excommunication regarding its founder, that is, shortly, I am convinced of it. 2. This very interesting analysis of events (French) by Father Paul Aulagnier, former secretary of Archbishop Marcel Lefebvre and one of the founding members of the Institute of the Good Shepherd (IBP), as well as rector of its seminary, has even been excerpted by the webpage of the same French District of the FSSPX. 3. And we remind readers of our own first editorial: A RORATE CÆLI Editorial: Holy See - SSPX, published on Quinquagesima Sunday, 2006. Benedict is delivering, as we always knew he would: the now, the optimum time, is his Pontificate (may it be long!). The emotional ones may move according to the winds of each month (Pope Leo XIII had already identified "the passion for discussing and pouring contempt upon any possible subject" as a symptom of Americanist impulses in Testem Benevolentiae)... We stay put: this is the time. A very interesting interview granted by the Superior-General of the Priestly Fraternity of Saint Pius X (FSSPX / SSPX), Bishop Bernard Fellay, has been published by the National Catholic Register (affiliated with the Legion of Christ) . [NCRegister:]...you say in your statement released in response to the motu proprio that there are still doctrinal difficulties. There’s also the issue of excommunication, which, some say, is not something that can be easily resolved. 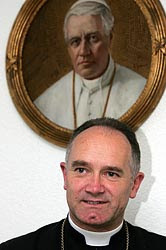 [Fellay:]My response to that is very simple: The authorities in Rome consider it to be easy. They very clearly don’t consider it to be a very difficult matter. To go back to Cardinal Castrillon, he said in a recent interview that with Summorum Pontificum, the door is wide open for a return of the Society of St. Pius X into full communion. He said: “If, after this act, the return does not take place, I truly will not be able to comprehend it.” Some would say therefore you are being unnecessarily difficult — that you should reconcile and then these issues can be discussed. It’s a point of view. The point of view of Cardinal Castrillon has always been to solve the problem practically, without discussions. Let’s sign the document, the agreement, and then later on we’ll discuss. That is his position. We say we would like to but we can’t because if we do so, tomorrow we’ll be in the same problem we’re in now. We fear if that happens, then tomorrow we get the same censures as we have now. So first we must discuss and clear things. What direction would you most like the Vatican to take now? Continue in that direction; it’s a very good start. We are really grateful to the Pope and we understand that he had to face a very, very strong opposition from many bishops’ conferences. So we are really grateful to him. Do you feel you’ve been vindicated in a way, that it’s been worth the struggle and it will perhaps make you and the society even more convinced of your own position? I’ve never seen it in that light. Our concern is to go to heaven, to be saved, and, let’s say, the good of the Church. If all goes well for the whole Church, we are pretty sure we will go well, too. In his explanatory letter on the motu proprio, the Pope said that neither knowledge of the old liturgy nor Latin is common among priests, indicating that it probably won’t be widely used in any case. Is this a problem for you, that there won’t be a renaissance of the old rite, which you hope for? We have always looked on this as a long process. It’s very obvious that right now, there will be few who will take the opportunity given to them. But that’s normal because, as the Pope says, many don’t think there is an old rite, or don’t know Latin. So it’s normal that it will take time, but we are sure that if the opportunity is given to them, and there’s the appreciation of what this rite consists of, then no doubt it will come. You don’t think, though, that these things, the meaning of the text, must evolve over time and so become clearer and less ambiguous? You have a text. The words used were expressly used to be ambiguous. It’s recognized by so many scholars, theologians in the Church. It’s a fact and we can’t help it. It’s true, it’s there. So it means the Church will have the duty in the future to make it clear. And this text that came out yesterday [“Responses to Some Questions Regarding Certain Aspects of the Doctrine on the Church”], we’re not very happy with it, but it is an attempt to make it clearer. So you do welcome the attempt? Do you have any other final reflections on Summorum Pontificum? We are really happy with it, and we do consider this the most supernatural act possible. It’s a very courageous act of the Pope, very supernatural, and we do hope it brings many blessings on the Church, even if the blessings will not appear immediately. It would be a good idea to gather all episcopal reactions to the Motu Proprio Summorum Pontificum from around the world. Please, post them in the comment box, in any language. We thank the reader who sent us this confusing Reuters dispatch (Vatican: We may drop revived prayer offensive to Jews), but details of what Cardinal Bertone would have exactly said in the press conference regarding this question do not seem absolutely clear. Italian news agency Apcom reports that the Cardinal said: "It is true, one prays for the conversion of the Jews in the Missal of 1962... but the problem could be studied and it could be established that all say the formula approved by Paul VI". Bertone added that, "The observance of the motu proprio would solve all problems" [this would also have been said by the Cardinal, according to the several news agencies, regarding the words of Art. 2 of Summorum Pontificum, which forbids "private masses" for both forms of the Roman Rite in the Sacred Triduum - though, as has been made clear elsewhere, not "public celebrations"]. It does seem that the Cardinal wisely wished to defuse the question with this answer. The exact unabridged words of the Cardinal on the press conference granted in Lorenzago di Cadore today do not seem to be available. 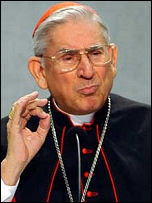 UPDATE (1200 GMT): The exact question to Cardinal Bertone regarding this matter and his answer were made available today. They reinforce our view that the Cardinal simply wished to defuse an uncomfortable question, and did it wisely. There has been a great debate regarding the Motu proprio on the Tridentine Mass. How do you see the reactions of the Jews, who feel offended because it still contains an invitation to their conversion? [Bertone:] The Jews, as John Paul II said, remain our older brothers. In the first [sic] Canon of that Mass, "our Father Abraham, father in the faith, and the High Priest Melchisedech" [sic] are invoked. I know of many rabbis who are glad about this. The formula regarding the Jews? The word 'perfidious' has already been removed. The problem of the "conversion" may be solved with a decision valid for all. For instance, using the formula of the liturgy for Holy Friday of Paul VI. Moreover, every priest may choose between the Tridentine Missal and that of Paul VI in the triduum of Holy Thursday, Friday, and Saturday. It is also fair to value the richness and beauty of the Latin language. Did you know that in China hundreds of universities have asked the Salesians [to provide] Latin instructors? Source: Repubblica; Transcript: Papa Ratzinger. -1) The website of the Vatican City State has been launched. 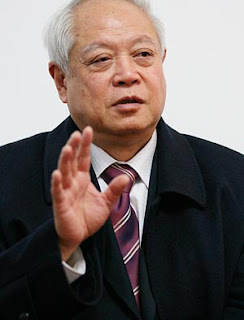 -2) The Holy See has agreed with the designation, by the "Patriotic Association", of the new Bishop of Beijing, Father Li Shan (according to Italian news agency ADNKronos -Update: ADNKronos has removed its original story; in his press conference in Cadore today, Cardinal Bertone has denied that previous approval was sought of the Holy See, but added that "the chosen Bishop is a very good and qualified individual and this is certainly a very positive sign"; Li was in the shortlist of episcopal candidates for Beijing regarding whom the Holy See had not presented any objection). -3) Over 140 reports of episcopal reactions to Summorum Pontificum from around the world are available here; please, keep them coming. Ave Maria, gratia plena. 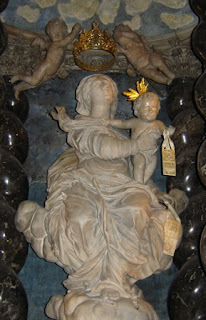 We have still some things to say of the grace of the most sweet Mary. ...consider in Mary the grace of the Gifts of the Holy Ghost. To this grace Mary, giving thanks, could apply the word of Ecclesiasticus: "In me is all grace of the way and of the truth." What wonder if she herself is the grace full of life and truth, who is the Mother of Him who was "full of grace and truth"? And what wonder if in that rod is so great an affluence of the Gifts of the Holy Ghost, in whose flower the Holy Spirit rested with such an abundance of His gifts? Mary is that rod, and the Son of Mary is that flower, of whom it is said in Isaias: "There shall come forth a rod from the root of Jesse, and a flower shall ascend from that root, and there shall rest upon Him the spirit of wisdom and of understanding, the spirit of counsel and of fortitude, the spirit of knowledge and of piety, and he shall be filled with the spirit of the fear of the Lord." On this flower was a great abundance of the Holy Spirit, which has overflowed into the whole Church, so that the Evangelist John says: "Of His fullness we have all received, and grace for grace." Now that such an abundance of grace has overflowed from this flower into the whole garden, how much more will it abound in the rod or stem of the flower, in Mary herself? Let Mary, therefore, say in all security, "In me is all grace of the way and of the truth." Certainly the grace of the way and the truth consists in the aforesaid seven gifts of the Holy Ghost; it was by the aforesaid seven gifts that the grace of the way and the truth was in Mary. The grace of the truth set Mary in order in the truth above herself, below herself, in herself, and without herself. The grace, I say, of the truth set Mary in order above herself by the gift of Wisdom; below herself, by the gift of counsel; in herself, by the gift of understanding; without herself, by the gift of knowledge. 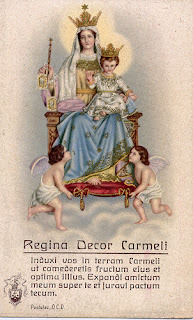 The grace of the truth set in order the soul of Mary in truth above herself, in the most wise contemplation of things to be enjoyed; below herself, in fleeing foresight of things that were to be shunned; in herself, in her sure knowledge of what to believe; without herself, in a most reasonable discretion concerning all she had to do. The grace of her life set Mary in order in a good life with regard to the devil, with regard to her neighbor, and with regard to God: the grace, I say, of life set Mary in order in a good life; towards the devil, by fortitude; towards her neighbor, by the gift of piety; towards God, by the gift of fear. The grace of life set Mary in order in a most strong resistance to the devil; in a most loving kindness to her neighbor; in a most devout reverence towards God. ... he who desires the sevenfold grace of the Holy Spirit must look for the flower of the Holy Spirit in the rod. By the rod or stem we attain to the flower, and so to the Spirit that rests upon the flower. By Mary we approach to Christ, and by the grace of Christ we find the Holy Spirit. Therefore St. Bernard well says, addressing Mary: "By thee we have access to thy Son, O blessed finder of grace, mother of life, mother of salvation, that by thee He may receive us, who by thee was given to us." FOLHA - How will the decision to say the Traditional Mass be taken? May this return to the ancient Mass be seen as an example of the return of the Catholic Church, under Benedict XVI, to conservatism? The new Mass corresponds to the theology of the 1960s. The ancient Mass, to a theology which has been eternal in the Catholic Church. In this context of changes in the Catholic Church, what is the role of the Institute of the Good Shepherd, to which you belong? The institute is a trial balloon for the "motu proprio" and also a call for a rapprochement with the Fraternity of Saint Pius X, considering that all the initial members of the institute came from this group. Also: Interesting interview with Dr. Alcuin Reid (Australian Broadcasting Corporation, starts at approx. 38min; transcript also available). "On the eve of the ides of July, 1570"
Missale autem Romanum a S. Pio V promulgatum et a B. Ioanne XXIII denuo editum habeatur uti extraordinaria expressio eiusdem "Legis orandi" Ecclesiae et ob venerabilem et antiquum eius usum debito gaudeat honore. ... Proinde Missae Sacrificium, iuxta editionem typicam Missalis Romani a B. Ioanne XXIII anno 1962 promulgatam et numquam abrogatam, uti formam extraordinariam Liturgiae Ecclesiae, celebrare licet. standing tall on its 437th anniversary! 1. It seems a new institute dedicated to the Extraordinary Form of the Roman Rite has been recognized. The small Oasis de Jesús Sacerdote (Oasis of Jesus Priest), founded in Argentona (Province of Barcelona), Catalonia, Spain, in 1965, with diocesan approval (afterwards, in irregular canonical situation), seems to have been recognized as a Contemplative Community of Pontifical Right, by a document signed by Cardinal Castrillón Hoyos on June 28, 2007. The document is still not available online. (Source: Le Forum Catholique). Cardinal Castrillón had mentioned the negotiations with the Oasis in his Aparecida address. 2. 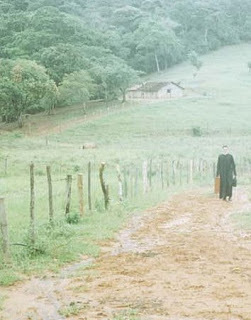 If you wish to help the work of the Apostolic Administration of Saint John Mary Vianney, in Campos, Brazil, the only Particular Church authorized to use the extraordinary form of the Roman Rite (the Traditional Latin Mass) as its exclusive rite, including the construction of its new seminary, please visit this webpage, which will remain linked in our sidebar (Help Campos). In his most recent extensive interview, the Superior-General of the Priestly Fraternity of Saint Pius X (FSSPX / SSPX), Bishop Bernard Fellay, talks to Brian Mershon - the only print journalist who did not miss a single beat regarding the motu proprio - on the release of Summorum Pontificum and on prospects for the future. I think we have to salute and to greet this date and this motu proprio as a very significant historical event in the history of the Church and in post-Vatican II history. This has to be noted. I think it is very important. Nevertheless, this does not mean it is perfect—especially when we link the motu proprio with the letter [to the bishops]. The letter is, if I may say it, the usual Vatican language. It is very unfortunate. But nevertheless, this letter has to be understood as a political letter which most surely does represent his personal thinking. Nevertheless, it is more than unfortunate in many ways, especially where he insists upon the necessity to recognize the value and the holiness of the New Mass. He plays both sides against each other. And the modern bishops that are progressive—they will jump on that point immediately trying to dismantle the motu proprio. ...this motu proprio is a step in our direction. It is most probably the will of Rome to answer to our first precondition. It is nice. Is it enough to say, “We can now just go ahead?” Well, we can just look at this text published today [on the nature of the Church from the CDF] and you have the answer. Look. It is a good step forward, but that does not mean that everything is solved. Absolutely not. The second point on the Roman side: as far as I know, they consider the [lifting of the decrees] of excommunication less difficult than the motu proprio. That’s the only answer I can give you. ... It is the word of Cardinal Castrillón [in the letter] when he sent me the motu proprio [the week before Summorum Pontificum was issued]. That is the first contact of the Cardinal with me since the 15th of November 2005. ... in the [Pope’s] letter that accompanies the motu proprio on the Mass ...the Holy Father says it is an internal matter within the Catholic Church — in the Church. It clearly states that it is not about a schism. It is about an interior dispute which requires an interior reconciliation within the Church. So we have it from the word of the boss. Our Pope says it is not a schism. Read also: original text of the short interview granted by Fellay to Vittorio Messori - Corriere della Sera (in Italian). For young ladies thinking about vocation! 1) Duration: from October 2007 until June 2008 included, in Perpignan (Southern France) under the responsibility of Fr. William Vojtek, FSSP. Applications to be sent (see address below) until September 14, 2007. 2) Program: Initiation with the spiritual life and the community life; secondarily: pedagogics, liturgical chant and parochial services (for example teaching children, visiting the persons in need, contributing to sacristy tasks). 3) Trainers: The trainees will be under the pastoral responsibility of priests from the Priestly Fraternity of Saint Peter (an international community of pontifical right, of Extraordinary Roman rite). Director of the training course: Fr. William Vojtek, FSSP: with a rich experience of many years in the formation of applicants to consecrated apostolic life, also in regular contacts with numerous religious female communities. Fr. Jean-Eric Diehr, FSSP, a medical doctor, will bring additional training on some psychological aspects of the pastoral service. Visiting speakers, in particular some apostolic religious nuns, are envisaged. 4) Costs: The expenses of lodging, teaching and subsistence will be covered by the FSSP, but transport charges, health insurance and personal expenditure will have to be covered by the trainees or their families. 5) Engagements: no formal promises or vows of any kind and no religious habit during these 9 months. 6) Criteria: French-speaking young ladies (from any country), at least 18 years of age, baptized Catholics, in good physical and psychological health. 7) Next step: If it pleases God, the training course will lead to a formation with the consecrated life (in a noviciate linked with the FSSP), but it does not guarantee it. It is expected that such further formation might be provided in North America. However, the training course is conceived in itself as an enriching experience, offering to young ladies a 9-month initiation to the spiritual and community life, including teaching and charity work, during one school year. The training course will have achieved an estimable goal while bringing the benefit of a spiritual maturation and a deepening of the Christian virtues in the service of neighbours, through the Roman traditions of the Church. Adresse postale: "Stage vocationnel 2007-2008, Maison Saint Pierre Canisius, Chemin du Schoenberg 8, CH-1700, Fribourg, SUISSE"
"For thirty seven years, a whole generation of militant Catholics, religious or lay members of the Militant Church (a generation reaching from 7 to 97 years of age) suffered, without giving in, openly defying the arbitrary interdict on the Traditional Mass. We think of our dead: Cardinal Ottaviani, Father Calmel, Father Raymond Dulac, Monsignor Renato Pozzi, Monsignor Lefebvre, Father Guérard. And, among the laymen: Cristina Campo, Luce Quenette, Louis Salleron, Eric de Saventhem. The pontifical goodwill is for them as a light breeze, which sweetly brings peace to their tombs. Wherever they are now, they do not need it anymore. But it is their memory amongst us which is appeased and elevated." 1. Thomas Woods reminds readers in his most recent article (and it is a duty in Justice; it must not be denied nor forgotten! ): "For several decades, not only the Catholic left but also the 'orthodox' Catholic right condemned supporters of the 1962 Missal as disobedient, wicked, schismatic – you name it – because they believed that what was beautiful and venerable yesterday could not cease to be beautiful and venerable today. They likewise found it hard to believe that they were considered a little bit crazy, perhaps even in need of counseling, because they longed for the traditional Mass, the very thing they had been taught their whole lives to venerate." The International Summorum Pontificum Contact Database, now covering Australia, Brazil, Canada, Germany, Spain, France, United Kingdom, India, Italy, Mexico, New Zealand, Poland, and the United States. 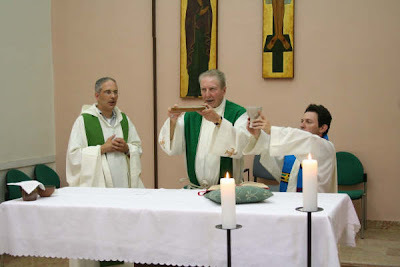 Bishop Fernando Areas Rifan was ordained a priest by Bishop Antonio de Castro Mayer on December 8, 1974, and has been celebrating the Traditional Mass (the Mass in the extraordinary form of the Roman Rite) since then. 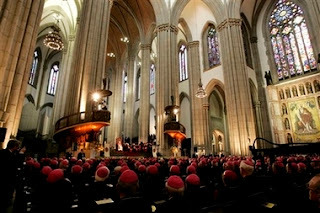 As the Bishop of the only Particular Church exclusively dedicated to the celebration of all the sacraments according to the ancient use of the Roman Rite (the Apostolic Administration of Saint John Mary Vianney, in Campos, State of Rio de Janeiro, Brazil), we have asked him certain questions regarding the application of the Apostolic Letter given motu proprio Summorum Pontificum. Bishop Fernando Rifan, we now know the contents of Summorum Pontificum and of the papal explanatory letter. Many Traditional Catholics throughout the world, though filled with gratitude to the Pope, believe that, despite the changes, they will remain hostages of a hostile situation, as happened with the motu proprio Ecclesia Dei, whenever their diocesan ordinary does not wish to comply with the papal will. What does the new motu proprio generally change, in relation to the indult system established by John Paul II with Quattuor Abhinc Annos and the motu proprio Ecclesia Dei? There will always be hardships. The cross is, indeed, one of the signs of God’s blessings. Yet this Motu Proprio is quite different from the previous one on the Mass of Saint Pius V. The other counseled; this one mandates, gives precise rules. And it places an instance in the Roman Curia for appeals in case of litigation or of the non-fulfillment of what is ordered in it. As far as you understand them, could you give us an overview of how the general procedure would work out for the groups of faithful, the steps the stable groups would have to take to have access to the Mass? First, the faithful who wish to attend the Holy Mass in the extraordinary form will have to follow the procedures indicated in the Motu proprio. As a first step, they should look for a priest willing to celebrate it privately, and even try to convince him, which will be easier since he has all liberty to do so. And they may attend his Mass. With the growth of the group, they may ask the parish priest for a public Mass in the parish church, particularly on Sundays. And, finally, they may attain from the Bishop a personal parish, which would be the maximum ideal, with Masses, catechism, spiritual direction, parish movements, etc., with the Mass of Saint Pius V.
Are there any procedural safeguards for the faithful and Priests who want access to the Mass? According to the Motu Proprio, the Bishop cannot prevent a priest from saying such Mass privately, nor a group of faithful from attending it (art. 2 and 4). Neither can he do anything against the Motu proprio. If he does, appeal to Rome is applicable. Your Excellency, we are particularly interested in Art. 7 of Summorum Pontificum, which states: ["Art. 7 If a group of lay faithful, as mentioned in art. 5 § 1, has not obtained satisfaction to their requests from the pastor, they should inform the diocesan bishop. The bishop is strongly requested to satisfy their wishes. If he cannot arrange for such celebration to take place, the matter should be referred to the Pontifical Commission 'Ecclesia Dei'."] Can a layman also appeal to the Commission, does he have standing to appeal to Rome if the Ordinary refuses to refer the matter to Rome? Not only the priests, but also the lay faithful may appeal to the Pontifical Commission Ecclesia Dei, which has papal authority to solve these matters. Assuming that a layman can appeal to the Ecclesia Dei commission directly, in the case of Art. 7, does the Commission have the power to solve the problem? It is clearly expressed by the document that the Pope has just endowed the Pontifical Commission Ecclesia Dei with wider powers than it had before, as it can be seen from art. 12: "the authority of the Holy See, supervising the observance and application of these dispositions." Bishop Rifan, in the Explanatory Letter, Pope Benedict says that, "in order to experience full communion, the priests of the communities adhering to the former usage cannot, as a matter of principle, exclude celebrating according to the new books". Even though this is not part of the legal text, does it mean that the priests in these communities dedicated to the Extraordinary Form may be forced to celebrate rites according to the Ordinary Form? No one will be forced to celebrate in the new rite. But the possibility cannot be excluded in principle. Even if the Mass in the rite of Saint Pius V is celebrated exclusively, as we do here in our Apostolic Administration by concession of the Holy See, the possibility of celebrating in the ordinary rite cannot be excluded as a matter of principle - it is a matter of coherence, that is the argument of the Pope. To exclude the celebration in a Catholic rite approved by the Church as a matter of principle would not be a manifestation of the Catholic spirit, and more, if as a matter of questioning the catholicity of the new rite, then it would be a position with incorrect theological implications, because the catholicity of a rite universally proclaimed for the entire Church by its Supreme authority and preserved by the Teaching Church would be put in doubt. The Holy See made public today the letter by which the Holy Father authorized the publication of the final document of the Aparecida Conference (the "Fifth General Conference of the Latin American and Caribbean Bishops", opened by Pope Benedict on May 13, 2007). 109. We regret a certain clericalism, certain intents to return to an ecclesiology and a spirituality prior to the Second Vatican Council, certain reductionist readings and applications of the Conciliar renewal, the absence of a sense of self-criticism, of an authentic obedience and of the evangelical exercise of authority, the moralisms which weaken the centrality of Jesus Christ, the infidelities to the doctrine, to morals and to communion, our feeble experiences of the preferential option for the poor, not a few secularizing falls in consecrated life, the discrimination of women and their frequent absence from pastoral organizations. As the Holy Father spoke in the Inaugural Speech of our Conference, "one can detect a certain weakening of Christian life in society overall and of participation in the life of the Catholic Church". 100. b) We regret both the intents to return to a kind of ecclesiology opposite to the renewal of the Second Vatican Council41, and some reduccionist readings and applications of the Conciliar renewal; we regret the absence of an authentic obedience and of an evangelical exercise of authority, the infidelities to the doctrine, to morals and to communion, our feeble experiences of the preferential option for the poor, not a few secularizing falls in consecrated life, influenced by a merely sociological, and not evangelical, anthropology. As the Holy Father spoke in the Inaugural Speech of our Conference, "one can detect a certain weakening of Christian life in society overall and of participation in the life of the Catholic Church". The regret for "a certain clericalism" was removed. The criticism of "intents to return to an ecclesiology and a spirituality prior [anteriores] to the Second Vatican Council" was substituted with a criticism of "intents to return to a kind of ecclesiology opposite to the renewal of the Second Vatican Council"; adding to the irony of this substitution, note 41 was added: "Benedict XVI, Address to the Roman Curia, December 22, 2005". Yes... the Latin American Bishops' criticism of pre-Conciliar "spirituality and ecclesiology" was turned against them with the help of Benedict's epoch-making speech... and became a criticism of the Bishops' own hermeneutics of rupture and discontinuity. Also removed were criticisms to "the absence of a sense of self-criticism", "the moralisms which weaken the centrality of Jesus Christ" and to "the discrimination of women and their frequent absence from pastoral organizations". This other great gem was added to the "regret" for the secularization of consecrated life: "influenced by a merely sociological, and not evangelical, anthropology". Could a more scathing rebuke of the orders and societies which have been undermining the mission of the Church in Latin America be found? In these Petrine changes, it is possible to sense the same reprimand which the Holy Father addressed to the Bishops of Brazil in the most relevant address of his journey to Latin America (and one of the most remarkable texts of his entire pontificate) - a papal reprimand which has gone unheeded, as the silent reception of Summorum Pontificum by almost all Latin American Bishops and Episcopal Conferences has made clear once again. Tip: Creer en México (sidebar), for readily finding the altered paragraph. 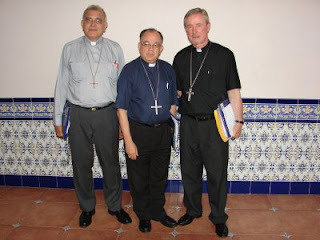 In the second picture, the new president and vice-presidents of the Latin American Episcopal Council (CELAM), elected this week in Havana, Cuba. To read all our coverage of the Aparecida Conference, just click on the "Aparecida Notes" label below. "...the workers of the Vatican Publishing House: they will officially reprint - a true symbol - the four volumes of the edition of the Tridentine Missal, revised by John XXIII in 1962! [sic]"
1. UPDATE - Interview (Brian Mershon) with the superior of the North American District of the Institute of Christ the King, Msgr. Schmitz. certain aspects of the doctrine on the Church"
This was exactly what John XXIII said at the beginning of the Council1. Paul VI affirmed it2 and commented in the act of promulgating the Constitution Lumen gentium: "There is no better comment to make than to say that this promulgation really changes nothing of the traditional doctrine. What Christ willed, we also will. What was, still is. What the Church has taught down through the centuries, we also teach. In simple terms that which was assumed, is now explicit; that which was uncertain, is now clarified; that which was meditated upon, discussed and sometimes argued over, is now put together in one clear formulation"3. The Bishops repeatedly expressed and fulfilled this intention4. Response: Christ "established here on earth" only one Church and instituted it as a "visible and spiritual community"5, that from its beginning and throughout the centuries has always existed and will always exist, and in which alone are found all the elements that Christ himself instituted.6 "This one Church of Christ, which we confess in the Creed as one, holy, catholic and apostolic […]. This Church, constituted and organised in this world as a society, subsists in the Catholic Church, governed by the successor of Peter and the Bishops in communion with him"7. In number 8 of the Dogmatic Constitution Lumen Gentium ‘subsistence’ means this perduring, historical continuity and the permanence of all the elements instituted by Christ in the Catholic Church8, in which the Church of Christ is concretely found on this earth. Response: The use of this expression, which indicates the full identity of the Church of Christ with the Catholic Church, does not change the doctrine on the Church. Rather, it comes from and brings out more clearly the fact that there are "numerous elements of sanctification and of truth" which are found outside her structure, but which "as gifts properly belonging to the Church of Christ, impel towards Catholic Unity"11. "It follows that these separated churches and Communities, though we believe they suffer from defects, are deprived neither of significance nor importance in the mystery of salvation. In fact the Spirit of Christ has not refrained from using them as instruments of salvation, whose value derives from that fullness of grace and of truth which has been entrusted to the Catholic Church"12. Response: The Council wanted to adopt the traditional use of the term. "Because these Churches, although separated, have true sacraments and above all – because of the apostolic succession – the priesthood and the Eucharist, by means of which they remain linked to us by very close bonds"13, they merit the title of "particular or local Churches"14, and are called sister Churches of the particular Catholic Churches15. "It is through the celebration of the Eucharist of the Lord in each of these Churches that the Church of God is built up and grows in stature"16. However, since communion with the Catholic Church, the visible head of which is the Bishop of Rome and the Successor of Peter, is not some external complement to a particular Church but rather one of its internal constitutive principles, these venerable Christian communities lack something in their condition as particular churches17. On the other hand, because of the division between Christians, the fullness of universality, which is proper to the Church governed by the Successor of Peter and the Bishops in communion with him, is not fully realised in history18. Response: According to Catholic doctrine, these Communities do not enjoy apostolic succession in the sacrament of Orders, and are, therefore, deprived of a constitutive element of the Church. These ecclesial Communities which, specifically because of the absence of the sacramental priesthood, have not preserved the genuine and integral substance of the Eucharistic Mystery19 cannot, according to Catholic doctrine, be called "Churches" in the proper sense20. The significance of "Private Masses"
Under Summorum Pontificum, Masses without the people ("private Masses") will be particularly important, first and foremost for priests, but also particularly for small groups of faithful. 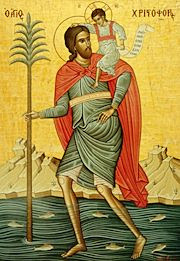 The right of all priests in the Latin Church to celebrate their private Masses in the extraordinary form (Missal of Bl. John XXIII) is clear. Not only that: the law, in one of its most important articles, establishes a clear equivalence of rights for both forms in the celebration of private Masses. 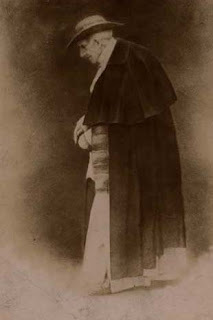 The priest shall choose that which is more convenient for him, or to which he is more attached, or... it does not matter why, his motivations for choosing either Missal for his private Masses are absolutely immaterial: the law does not establish any condition whatsoever and no permission is ever necessary (Art. 2: Ad talem celebrationem secundum unum alterumve Missale, sacerdos nulla eget licentia, nec Sedis Apostolicae nec Ordinarii sui), and the establishment of any additional condition is illicit (general principles of Canon Law are objectively applicable and cannot hinder the celebration of the Mass in the extraordinary form). This also means that no authority whosoever may curtail the right of priests to celebrate private Masses in the extraordinary form (for instance, of a priest visiting a shrine). Let us recall that additional conditions and permissions apply only to article 5 provisions (that is, "public Masses"). The rector of a shrine may act upon art. 5, § 5 (which applies to "public Masses"), according to the general rules set in article 5, but he must not discriminate between private Masses of visiting priests: all priests in good standing (Art. 5, § 4: idonei... ac iure non impediti) are allowed to say private Mass according to the form of their choice. That the lay faithful may attend private Masses has always been the case: and, just to avoid any misinterpretation of the latitude awarded to priests and faithful, art.4 makes clear that these Masses (which all priests may celebrate everywhere, as Summorum comes into effect) may be attended by the faithful who ask to be admitted, with no special authorization (admitti possunt, servatis de iure servandis, etiam christifideles qui sua sponte id petunt). There is no doubt that the wide, complete, and absolute liberation of private Masses in either form (Summorum considers both of identical legal importance for such Masses), with the full licitness of the attendance of the lay faithful is the most far-reaching measure enacted by the act - if priests wish to enjoy the great liberating right which the Pope has recognized as theirs and if the faithful are wise enough to approach those priests who may be willing to celebrate according to the extraordinary form. Private Masses with the attendance of lay faithful may be particularly appropriate in those areas in which there are not exactly "groups" of lay faithful interested in the Traditional Mass, as well as in the initial steps in the formation of "groups stably constituted".